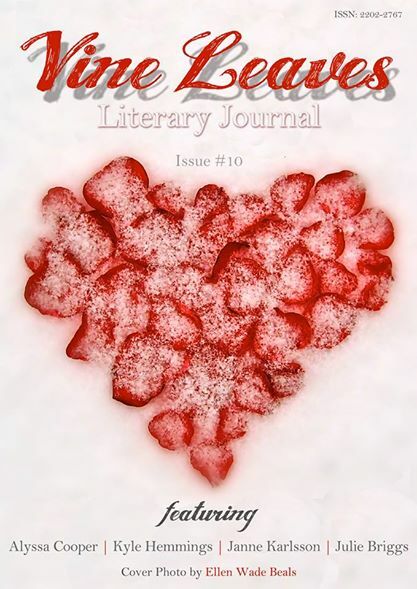 My first ever poem’Ambrosia’ is published today in Issue 10 of Vine Leaves Literary Journal. I have to have a bit of a giggle, because it’s a love poem, but as far removed from the angst-ridden and terribly rhymed poems of my adolescent as possible. The original imagery (of a woman in red stepping from a train onto a grey dismal platform) came in early December, not long after I’d finished writing my novel, my brain broke and poetry came out. While I had various lines of poetry, it took almost three months to bring it all together. The line about the brulée I recited from Toowong to Wilston, down Coronation Drive, when it came to me en route from Stacey’s place to Lois’s in early February. As soon as I pulled into Lois’s I grabbed my phone and madly tapped the line into notes, so grateful I hadn’t lost it on the trip. I share the ToC (and ironically, the same page!) with Adam – who also gets to claim the title of ‘published poet’ today. You’ll find us on page 23. Vine Leaves is a free publication and can be read online with Scribd or can be downloaded as a PDF. Many thanks to the ever-wonderful Jessica Bell for taking a chance on the poem, and those in my writing group for their feed back (especially Stacey who went through it with her trademark brand of razor sharp editing). This entry was posted in Announcements, Poetry, Year of the Horse and tagged Adam Byatt, Ambrosia, caramel, Jessica Bell, love poem, Poetry, train platforms, Vignette, Vines Leaves Literary Journal by Jodi Cleghorn. Bookmark the permalink.